You have an iPhone? This time there is an iPhone case that would make many people nostalgic for the old-fashioned where mobile technology has just grown and certainly many people will be staring at your iPhone when using this casing. 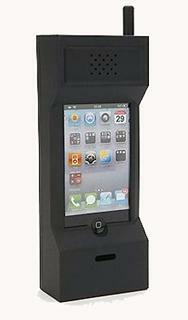 Price casing is 20 American dollars that could be used for the iPhone 3G, iPhone 3G and 4. Casing is named 80s Cell Phone Case, which means the casing of the 80-year time yes.